Your Place or Mine, Valentine? As I’ve written, after the events of this New Year’s Eve, I’m through relying on the professionals for holiday festivities. Nope, the true professionals have the evening off and are celebrating themselves leaving you with the second string. But that doesn’t mean that mean Mrs. E. and I won’t be celebrating Valentine’s Day. It just means that we’ll be doing the cooking, serving and cleaning. So I’m going easy on us. I suggest for those of you staying in that you do the same…. Let’s see, something special for dinner? Well, not going out and having that second bottle of Champagne with dinner, cabbing back and paying off the babysitter means that we’ve got an extra $200 to spend. While real caviar is a bit too expensive for my wallet these days, there are some pretty good deals on substitutes: we’ll have paddlefish roe. And we’ll probably eat it by the spoonful — pure decadence. Champagne isn’t really the best bet to drink with roe (unless it is a blancs de blancs.) A shot of ice cold vodka is traditional. The lemon flavored ones would pair nicely. A bone-dry martini, up with a twist, is pure heaven. Don’t like roe? Opt for a bit of sushi or sashimi picked up from the grocery. Or buy a couple of oysters, throw them on the grill until they open and squeeze a little fresh lemon juice over them. Next I’ll make some little artichokes that I found at the store — cutting them in half and sautéing them in olive oil, garlic, oregano and sea salt, sprinkling them with a little fresh parmesan. You may want to substitute something like an arugula salad, dressed with salt, pepper, olive oil and shaved fresh parmesan cheese. Then we may have a lobster bisque or cream of she crab soup. Both are made fresh by my fish monger. The bubbles will do fine here. And we’ll follow it up with a fresh fillet of fish, broiled skin side up (make three slashes in the skin to let the humidity escape) under high heat until the skin is crispy. I’ll season the fish with no more than olive oil, salt, pepper and a squeeze of lemon. Maybe a fresh herb if I have one handy. Or I’ll sprinkle dried parsley around the plate to garnish. Dessert is more sparkling wine and a chocolate truffle. Polish the silver, light plenty of candles, chill the wine and stay in for the night. Soundtrack by Francis Albert Sinatra and Billie Holliday. This entry was posted in Entertaining and tagged Entertaining, holidays, menus. Bookmark the permalink. 11 Responses to Your Place or Mine, Valentine? Gaaaa! (But the eggplants — that you must have stumbled upon while running pell-mell from the artichoke “sweet tea” — looked fantastic.) You have hidden talents… another blog on another subject entirely! Nicely done, Fairfax! I can barely keep my thoughts in order on this one. Did you see how teeeny the eggplants were? I could have taken the same photo with regular size eggplants next to cabbages, but this was teeeny eggplants with brussels sprouts. Did you see i got the soap!!!! Sounds lovely. I am hoping to drag the hubby away from work long enough to grab some sushi. Perhaps some Sinatra and champagne at home shall follow. Thanks for the suggestions. P-D, yeah, they were lovely. I can imagine doing individual moussaka with them. BA, oh please do. Work on Valentine’s must end at least at 6 PM. Festivities to commence at once, by the order of the Commanding Cupid. My husband is in the Hebrides so home alone! Lots of crumpets and Marmite. A chilled glass of wine or two……knitting and fresh flowers abounding for me. And loving no children’s mindings hither and yon for a whole week! Mr M and I will celebrate this weekend as we head to Scotland’s social occasion of the year – the Gala Ball hosted by the nation’s symphony orchestra. Waltzes, polkas and a little swing from the Big Band thrown in. Now that’s worth waiting for…. Ah Mrs. PVE, Happiest of Valentine’s Days. I’m very glad that the Pork Wellington went over well. That means I didn’t forgert an ingredient. Off to buy the truffles and fish for this evening! Mrs. M of Scotland, it’s not the calendar date that’s the important thing, you sound like you have Valentine’s Day all year ’round. This weekend will be here quick enough. ‘TIl then, may clouds of cupids speed you there. 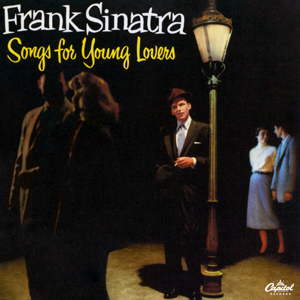 That image of Frank Sinatra’s early 50s album stopped me dead in my tracks. It was something I lifted from my father’s record collection when I first moved into my very own apartment, and it provided a background to the heart’s yearnings. Sinatra albums of that era (such as Wee Small Hours), but are you familiar with Close To You, which has a chamber group as accompaniment? It is perfection. Mr. W., I don’t know that one! I’ve got a good record store here in town; perhaps I can find it. Thanks for the tip. His phrasing is incredible (even if Dean did have the better voice after the 50’s.) Unfortunately I have “In the Wee Small Hours” and “Songs for young Lovers” on disc. I’d like to get ahold of the vinyl since the turntable is now hooked up to the stereo. luxury to have a turntable these days. Close to You is available on compact disc, by the way. But I agree~Frank was at his best in the 1950s.